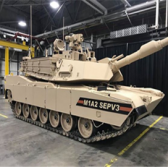 General Dynamics‘ land systems business has received a $58M contract to provide expedited active protection system kits for the U.S. Army‘s Abrams M1A2 battle tank. The company will deliver mounting and ballast kits for the system under the firm-fixed price contract, the Department of Defense said Thursday. The service branch obligated an initial amount of $12.7M in other procurement funds allotted for fiscal 2018 through 2019. Work will take place in Sterling Heights, Mich., through June 30, 2020.